DCU captain Caoilte Ó Baoill in action against UCC Bombers in this year's Fitzpatrick Cup. At the halfway point of the intervarsity sporting year, Odrán de Bhaldraithe charts the highs and lows of the DCU teams so far. It was DCU Hurling Club, generally the quieter of DCU’s two main men’s GAA clubs, that generated buzz in early October, through the announcement of the university’s first ever Freshers B hurling team and the revelation that Kilkenny star Richie Hogan would be a member of this year’s Fitzgibbon panel. The DCU sport season was kicked off by the Freshers hurlers, as they lost to defending All-Ireland champions NUI Galway in a tightly-contested affair in St. Clare’s. Despite the addition of Hogan, the seniors did not fare any better, losing their opening game to Dublin rivals DIT. A day later and the result was the same, only this time for the Freshers hurlers. Following a senior loss to UCD, the Freshers were the first hurling team to record a victory, against St. Pat’s/Mater Dei. The Freshers ended the month with losses to UCD by both the A and B teams. The football club had a much less hectic October, with just three games played among the teams in the college. The senior team started their league campaign well with an easy home win over Trinity College. Meanwhile, both Freshers teams started their seasons with trips to UCD, with the As drawing and the Bs recording a one point win. Elsewhere, DCU’s Collingwood soccer team got its league campaign off to a good start, firstly by avenging last year’s league final by beating DIT 1-0 in St. Clare’s. They then recorded a 5-2 win over UUJ to mark an undefeated start to the season. DCU’s Australian Rules Club participated in the making of history in October, entering the inaugural Fitzpatrick Cup, the first ever European intervarsity Aussie Rules competition. Despite encouraging performances from the beginners, the newcomers finished last of the four teams who entered, falling to UCC Bombers in the semi-final and NRC Eagles in the third-place playoff. It was not all defeats for DCU on the day, with club chairman and team captain Caoilte Ó Baoill being awarded the tournament’s Best & Fairest Award. DCU was also represented heavily at this year’s International Rules. Both captain and vice-captain were DCU alumni in Michael Murphy and Aidan Walsh. The 100 point aggregate victory also featured DCU coach Ross Munnelly and member of last year’s Freshers All-Ireland Champions Ciarán Byrne. November came with good news for DCU Camogie Club, as Kilkenny and DCU star Mairéad Power won her first Camogie All-Star at corner-back. It was a miserable month for DCU hurling, with no wins recorded by any competing teams. The Freshers finished their league with a loss to IT Carlow, while the Intermediates lost all three of their league games against UCD, DIT and IT Carlow. Things fared much better for the footballers, as November started with wins for both the Freshers A’s and B’s over Queen’s University. Despite losing to UUJ the following week, the Fresher A’s still qualified for the knock-out stages of the league. The Fresher B’s enjoyed a victory over DIT in their All-Ireland quarter-final and the Junior team won their semi-final over University of Ulster at Magee, but it was not to be all victories for DCU GAA, with the Fresher C’s falling to Sligo IT. However, the senior team were knocked out of the Ryan Cup, losing their last competitive game of the year to UCD. DCU’s soccer team lost 2-1 to UCD, their only loss of November. Despite this, the team still qualified for the quarter-final of the league with the added bonus of a home draw. The athletics season got underway in November with considerable success for DCU. The DCU Dragons team of Darren McBrearty, John Coghlan, David McCarthy, Darragh Greene and Joe Warne regained the club’s title at the IUAA Road Relays, smashing the course record with a time of 40:26. DCU entered an impressive six teams at the event, a college record. After coming back from the brink of extinction, there was plenty to celebrate for DCU Boxing Club as chairperson Rob Egan won Leinster gold in the 71kg category. The club were represented by four boxers at the tournament and were the only university present doing battle with the best of Leinster’s boxing clubs. It was a good start to the year for DCU Force as the university’s senior rugby team scored a 17-5 victory over NUI Maynooth in their first game of the year. However, they were quickly brought back down to Earth by an 83-12 trouncing at the hands of IT Carlow in St. Clare’s. 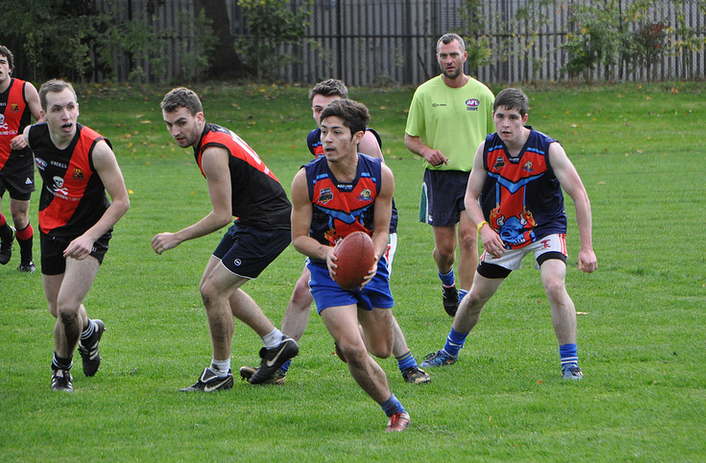 DCU Australian Rules Club came up against Dublin Demons in what was dubbed the ‘Dublin Showdown’. The game ended with a victory for the Demons by a margin of three goals, DCU being put to the sword by the goal-kicking of their own coach, John ‘Toasty’ Enright. Two DCU students, Ryan Scott and Shane Diviney, were part of the Dublin Universities rowing team that managed a top 10 finish in the Student Yachting World Cup. The event took place in Pornic, France and the team made up of Scott, Diviney and students from DIT and Trinity College finished ninth out of a total of over 150 competing teams. With exams coming around, naturally the sport season began to slow, but there were still some noteworthy events on the DCU calendar in December. The Freshers hurlers had two teams enter a seven-a-side blitz held by Cavan Institute. Both teams advanced to the semi-finals, with one team losing the final to DIT, who had fielded senior players. The Freshers footballers finished off their league campaign, first by seeing off the challenge of CIT in the semi-final, before valiantly falling to UCC in the final on a scoreline of 2-11 to 1-11. The senior soccer team fared better against Cork opposition as they beat UCC 2-1 to advance to the league semi-final, where they will now face IT Carlow. DCU Camogie also secured a victory over UCC, beating them 4-7 to 0-7 in their hugely important Ashbourne Cup qualifier.